The once busy town of Marshall is busy once again, thanks in large part to Zuma Coffee, Joel Friedman’s little café that keeps growing. 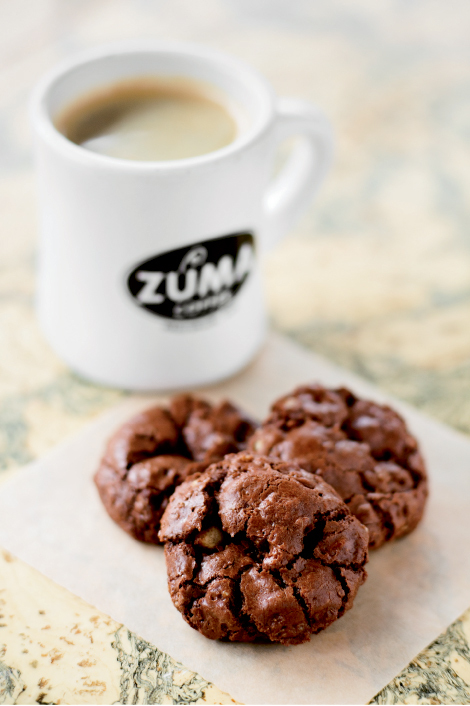 As of late, his popular Zuma Gold chocolate-espresso cookie gave rise to the Zuma Cookie Company, which produces the treats sold in markets across the region. Zuma Too: Cookies & Cones, a sister enterprise, opened last summer in a former Chevrolet showroom. Here, patrons can indulge in the fresh baked cookies paired with scoops made by Ultimate Ice Cream of Asheville. “We knew we had a customer base for this cookie when people came back from Spruce Pine, from Black Mountain, from all over the region to get it,” Friedman says. An Atlanta native who was attracted to Marshall’s slower pace, Friedman opened Zuma Coffee 12 years ago in a 450-square-foot space near its current location on Main Street. The place was so small that patrons had no choice but to be friendly. Sharing tables, they’d swap news and invite new folks into the circle. Zuma Coffee became such a popular gathering place that Friedman moved it into a larger space across the street. Nowadays, the front room fills with town regulars, artists from nearby studios, and cyclists taking a break from rides along the French Broad River. On Thursday nights, renowned fiddler Bobby Hicks leads a bluegrass jam that packs the house. Every Monday, Zuma becomes a blues and barbecue joint for a collaboration between Chef Ja Wall of HomeGrown in Asheville and musician Steve Davidowski.